If you’re like me, using a bus or tram is not part of everyday life. Heck, I’d never stepped foot on a bus before I started traveling in Europe. I used the subway once in New York and twice in DC. That’s it. Public transportation was just not part of my daily life and this is true for many Americans. Arriving in Europe, I looked at the bus like this big speeding object of stress that would make me feel like even more of an idiot in a country where I can’t even speak the language. In my hope to help Americans traveling in France, I’ve put together a newbie guide to public transport. While these tips are specifically for Nice, the bus and tram systems are similar throughout France and the rest of Europe. The first thing you need to know is that you will need coins or a chip and pin card to purchase tickets from the tram kiosks. American credit cards with a chip require a signature (called chip and signature), so they are not accepted at unmanned stations such as tram or train kiosks or parking meters. If you need coins, make a small purchase or two at a local store with the idea of getting change back. Most banks have signs that say “No Change,” but the post office usually has coin machines if you’re in a pinch. When purchasing from the kiosk located at the tram stations, don’t worry if you can’t speak the language. Turn the dial to select your country (US residents should choose the British flag), so you’ll be able to read the instructions in American, commonly referred to abroad as English. (That’s a joke). Press the button in the middle of the dial to select your option. You can also purchase tickets at the bus line office. In Nice, you can stop by Old Town to purchase tickets. Public transport offices are usually centrally located in larger cities, so finding help isn’t too far away. If you are traveling by bus, you can also purchase tickets on the bus from the driver. DON’T FOLD YOUR TICKET! If you fold you’re ticket, the machines can’t read them. You’ll find notices everywhere that ticket prices will not be reimbursed if you fold your ticket. At the tram stops, purchase your ticket at the kiosk prior to boarding. You can’t purchase tickets on the tram. Once you board, insert your ticket into the validation machine with the arrow pointing down. The machine will be beep, stamp your ticket and spit it back out. Take your ticket and keep it with you for the duration of the ride. If the red “X” on the display lights up, the ticket is invalid. Likely, you inserted the ticket the wrong way. Turn it around and try again. If the tram is crowded, don’t worry about immediately validating your ticket. Make getting on your priority. If you wait patiently outside while others validate, you may wind up staring at closed doors and the tram pulling away. Once you’re on board, validate your ticket(s) as soon as the machine is free. Once on board, find a seat or a place to stand and hang on. The jerking of the tram as it pulls away from the station can easily throw you off balance. If traveling with little ones, fold up the stroller during peak times to avoid glares from other passengers. When getting on or off the tram, it may be necessary to push the button on the door to open it. The tram will always stop at each location, but the doors may not open automatically. So, how do you know which tram to board and when the next tram will arrive? At each tram station there will be a TV hanging overhead. It will list the final destination (so you know which direction to head) and a countdown until the next tram arrival. Note: In Strasbourg, France tickets for the tram are validated at the tram stations before boarding. These validation machines were usually located next to the ticket sales machine. A 2nd was usually further down the platform. Bus routes and schedules can be obtained from the bus line office, tourism office, online and at the bus stops. I’m sure many of you are familiar with bus stops, even if you don’t typically ride on buses. These stops are located throughout the city. Simply look on the side of the enclosure to find the bus stop name and bus numbers serving that location. The bus route number and destination will be displayed on the front of buses, so you know which to board. It’s a good idea to lift your hand for a slight waive at the driver to let him or her know you would like to board. The buses usually stop when people are milling around the bus stop, but that isn’t always the case. If you don’t have a ticket from the transportation office or tram kiosk, you can purchase a ticket on the bus. Tell the driver how many tickets you need. Holding up fingers works well! You may also be asked your destination depending on the bus line. Exact change is preferred but the driver should have change. You’ll get a ticket to validate in the machine next to the driver or a receipt for your purchase. Once you have paid you way, head back and find a seat if one is available. If your traveling during peak hours, you may have to stand. Hold on to one of the bars and prepare to be jostled. Passengers will pack onto the bus – even when you don’t think there is room for more. Seating is reserved for the elderly and disabled, so be prepared to give up your seat if necessary. Each bus has a pre-determined route that can be found on the bus schedule. Most buses don’t advertise when they will be arriving at each stop, so it’s important to keep a bus schedule handy. As you approach each stop, check the name on the enclosure with the name on your schedule. Buses will have the routes posted overheard, but you may not be able to view the route from your seat. Once the bus leaves the stop just before yours , push the “stop” button. These buttons can be found throughout the bus. This will alert the driver to stop at your destination. Sometimes you will here a “ding” sound after pushing. Other times only a sign will light up in the front of the bus stating “arrêt demandé“. If there isn’t anyone waiting and if no one has pushed the button, the bus driver will usually just drive past the stop. Exit the bus from the door in the middle of the bus. This door is for exiting while the front door, by the driver, is for boarding. If the bus is extremely crowded and you happen to be at the front of the bus, you can exit using the front door. For those of you who have never traveled by bus, those schedules can be confusing! Once you have determined which bus line you need, based on your destination, it’s time to figure out when the bus will arrive at your stop. Each stop will be listed on the schedule. Pay attention to the interval times listed sideways off the far right side of the schedule. This will tell you how long it takes for the bus to travel between 2 destinations. From that point, you can get an estimate of the time the bus will arrive. I suggest arriving early – it’s not fun to miss the bus and be stuck for another 30 minutes to an hour waiting for another bus. The stops on the left are the more popular stops such as the airport or the train station along with the beginning and the end of the route. You can use the times from the chart on the right to figure when the bus is going to be at the other stops you might need. The chart on the right is a list of the stops within the villages. If you look above you will see 12:50 circled which is Aéroport T1. If you chose this departure time then you would be at Le Tunnel at 11:15 or (25 minutes later). Times vary depending on the day of the week. Monday – Friday (Lundi à Vendredi), Saturday (Samedi) and Sunday (Dimanche.) You may also find special schedules for holiday’s. The price of a fare will vary depending on your location. The passes and fees listed below are the current prices in Nice using the Lignes d’Azur. You will likely find similar passes throughout Europe, just for different rates. *If you purchase this on the bus it is only valid for THAT bus line. Purchase at the kiosk or at the ticket office if you want to be able to use on all bus lines or the tram. Some bus routes have special pricing, so be aware when purchasing your tickets. If you are traveling outside of the Lignes d’Azur area you will need to purchase tickets on the bus. These buses can be a little confusing and the driver will usually ask for your destination to know which ticket you need to purchase. In Nice, there are 2 bus lines. One for around the cote d’azur and are part of the Lignes d’Azur. If you are traveling outside of the cote d’azur, you are using the Alpes-Martitimes. These are bus #’s from 100+ and are grey colored on the bus stop signs. They start with stops along the Cote d’Azur then move out to other villages. The cost is the same 1.50€. For instance, if you are taking bus 500 and plan to go to Grasse, you will need to purchase your ticket on the bus. 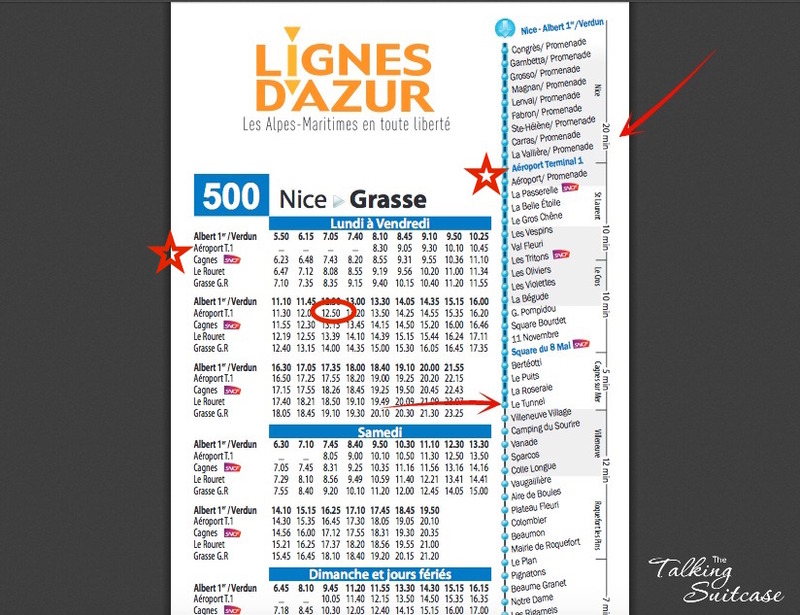 If you are only going as far as Cagnes Sur Mer, you can travel with your Lignes d’Azur ticket. Why? Grasse is outside of the Cote d’Azur. Alpes-Martitimes gets your money, not Lignes d’Azur. Make sense? If you look at the bus schedule above, you can see the arrow which points to the end of the bold blue line ending at Le Tunnel. This is the last stop of the Lignes d’Azur. The bus continues on uninterrupted just like any other bus. No changing busses or driver, the only difference is what ticket you purchase. I mention this because the best value for a family or those making multiple trips is the multi 10 voyages ticket. If you plan to visit places like Grasse on bus 500, Cannes on bus 200 or Vence on bus 400, you can’t use that Lignes d’Azur multi 10 voyages ticket. You’ll need to purchase a Alpes-Martitimes ticket on the bus for those locations. Always keep your ticket or receipt during your bus/tram ride. There is a hefty fee for not paying your way. Your validated ticket or a dated receipt will provide proof of purchase. There was a random stop during one of our travels. The bus stopped and 2 men came aboard checking tickets. We witnessed one women being sent up to pay her fare and another received a fine. I’m not sure what the difference between the 2 women was, but the point is you can be caught. I’d much pay for a 1.50€ fare than be fined 50€. Hopefully this will help newbies learn tips for using the bus and tram systems in France. What are your tips for navigating public transport in Europe? My wife and I will be on a 3-week trip to France and Italy this summer. We will each have a 26-inch rolling suitcase and a typical smaller rolling airplane carry-on bag. We won’t attempt to take luggage on buses but would like to take the tram from the Nice train station to our hotel. If we avoid a packed tram at peak time will there be room for those 2 bags for each of us. Thanks. Other than the airport bus 98, you’ll likely be told you can’t bring the full size suitcase on the buses in Nice. Let me know if you have other Nice questions. 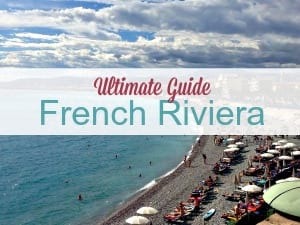 We also have a ton of articles on the French Riviera. Have a great trip! So helpful! I kept buying single tickets in Strasbourg because I didn’t know to turn the know. Very, very helpful. Thanks! We made that same mistake too!! I’m so glad the article was helpful! Would you recommend my 12 and 14 year old daughters ride the public bus in Nice by themselves or not? Hi, that is difficult to answer. I would allow my 13 year old son to ride the bus alone but not my 11 year old daughter. He is more responsible awhile she would end up lost even though she lives in the area. They are very different children. The buses are safe but they can get very crowded. A lot of children do ride the bus alone but they are local and know their way around the area, speak the language, etc. My daughters 9 year old friend rides the tram alone to and from school with a cellphone. I would let my kids ride the bus alone in Nice before I would let them ride alone in the USA. Sorry, I can’t give you a definite yes or no. Are your children used to riding public transport alone? Just looking at this post makes me nervous. lol I don’t know what it is about public transport. Maybe it is my small town blood that kicks in and rattles my nerves. I will need this in the future for sure! I love how much detail you’ve gone into here with the photos – super helpful! Fantastic that you put together all of this information. Using public transportation in a foreign country isn’t always so self explanatory. Many with thank you for your efforts! wow this is indeed a very detailed and useful post for those using public transport – great work! This is some great, detailed info! I wish taking public transportation was more common in the US. Looks like it’s clean and efficient in France. Good tip about validating your ticket. An un-validated ticket is not any better than not having a ticket at all! This is a great resource… thanks for sharing! Heading to France by November so will definitely keep this in mind! Thanks for sharing. Great details. I’m sure getting lost or going in the wrong direction is in my future in France but I’d love the chance to explore by train.